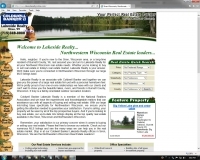 Welcome to RealEstateUpNorth.com, a directory of local real estate professionals throughout the Northern Wisconsin Area. This includes locations like Minocqua, Arbor Vitae, Woodruff, Lac du Flambeau, Eagle River, Boulder Junction, Tomahawk, Rhinelander, Presque Isle, Land O' Lakes, Manitowish Waters, Phelps, Mercer, and Pelican Wisconsin, just to name a few. Whether just visiting majestic Northern Wisconsin for the Summer, or looking for a year-round home; the links on this site are full of useful information that will help you find your property of interest. Good luck! Hello, neighbor. If you're new to the Siren, Wisconsin area, or a long-time resident of Burnett County, Wi, rest assured you can turn to Lakeside Realty for all your Northwest Wisconsin real estate needs. Whether you're looking to buy or sell real estate in today's real estate market, Lakeside Realty is your answer. 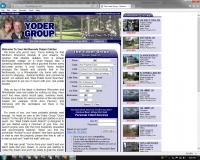 We'll make sure you're connected in Northwestern Wisconsin through our large MLS listings base. 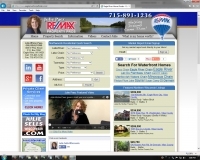 Hi, my name is Deb Hitchcock and I'm a licensed realtor and broker in North Western Wisconsin that includes the Siren, Wi, Danbury Wi, and Webster Wi areas. If you are interested in buying real estate or selling real estate such as waterfront homes, waterfront land, waterfront lots, residential homes, vacant land, commercial properties, lakeshore cabins, lakeshore properties, or cabins with acreage in northwestern Wisconsin in the Siren, Wi, Danbury Wi, Webster Wi, area or any lake side real estate in Burnett county, I'll be happy to assist you with your real estate business. 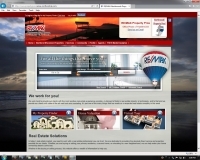 Hello, my name is Bob Coulman, a Real Estate specialist with RE/MAX First LLC based out of the town of Minocqua in the great Northwoods of Wisconsin. I have been a licensed real estate broker since 1987 and can help you find the perfect home for you in and around the Minocqua Wi area. 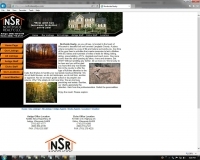 On this website you can search the entire Greater Northwoods MLS by town, lake, property type, or price. Some of the communities I specialize in are: Minocqua, Woodruff, Lac du Flambeau, Boulder Junction, Tomahawk, Rhinelander, Presque Isle, Manitowish Waters, and Park Falls. Welcome to Park City Realty, located in the beautiful city of Merrill, Wisconsin, known as the City of Parks. Our professional staff of realtors at Park City Realty can help you in selling property or buying property in the Merrill area. Why choose Park City Realty? Because we know Merrill real estate in and around the area. Whether it's residential property, waterfront property, farming property, commercial property, or a home for sale, Park City Realty is your professional hometown realtor in the Merrill area. My Name is Edmund R. Choinski: My friends call me "Chow". I've been a resident of Northern Wisconsin since 1979 and a property owner since 1988. For the last 24 years I have been a volunteer firefighter for the Town of Lake Tomahawk. I'm also an Oneida County elected delegate to the Wisconsin Conservation Congress. I know the area very well and have sold properties in most of the counties surrounding Oneida County. Welcome to our World! We serve Real Estate Buyers, Sellers and Investors in Minocqua and Wisconsin's beautiful northwoods, including Tomahawk, Rhinelander, Eagle River, Manitowish Waters, Phillips, Land O' Lakes and the surrounding areas. Serving Wisconsin's Greater Northwoods in Forest, Langlade, Oneida, and Oconto Counties. As professional REALTORS®, our pledge to you is to provide the finest service possible in the sale or purchase of your property. We will be there throughout the whole transaction to make it worry free for you as the consumer. Our experience in the "Great Northwoods" helps to make this all possible. As our motto says, "Putting You First". When it comes time for you to buy or sell your Eagle River real estate, let me assist you in making your dream a reality. My name is Julie Paez and I am your Northwoods Real Estate Professional in the Eagle River WI area including Vilas county, Oneida county, Florence county, Forest county, Gogebic county, and Iron county. The experts at Lakeland Land Company specialize in vacant waterfront land and wooded acreage across a large portion of Northern Wisconsin. If you're interested in selling or buying vacant property in Iron, Lincoln, Oneida, Price, or Vilas counties, you have come to the right place. 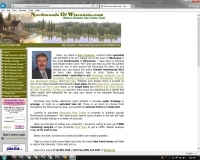 We have more Northern Wisconsin Land for sale than any other real estate company. We have vacant land listed near Minocqua, Tomahawk, Three Lakes, Mercer, Hurley, Eagle River and Rhinelander. I'm Gerry Fudala. I have been selling real estate for 20 years in this area and I also own the All Seasons Resort on the Fence Lake Chain in Lac Du Flambeau Wisconsin. I sell all types of Northern Wisconsin real estate including recreational property, waterfront residential homes, waterfront vacation cottages, waterfront vacation condos and waterfront vacant lots. I also sell off-water real estate including, seasonal and year-around homes, vacation cottages, vacant lots, hunting acreage, vacation resorts, businesses and commercial properties. Northside Realty, as you will see, is located in the heart of Wisconsin’s beautiful but well coveted Langlade County. A place where recreation is a way of life and nature surrounds you. Any time of the year there’s activities that create memories to last a lifetime. With 853 lakes and hundreds of miles of trails for hiking, biking, skiing, snowmobiling, ATV’s, dogsleds and much more. One more scenic than the other passing by lakes, rivers and streams. My name is Scott Freimuth. I am a Northwood's REALTOR and Real Estate Broker/Owner of NorWisRealty.com LLC independently owned Real Estate Company located in North Central Wisconsin. My Real Estate Company specializes in all types of Northern Wisconsin real estate to include waterfront primary residential and recreational properties, off water residential homes, vacant waterfront lots, vacant lots and acreage parcels for hunting or recreational activities as well as business, commercial and investment properties. When thinking of buying or selling your home, cottage, condo or land in Minocqua Northern Wisconsin, stop by RE/MAX First LLC of Minocqua for all your Real Estate needs. Specializing in Northern Wisconsin Lakefront Homes & Off Water Homes, Lakefront Vacant Land & Off Water Vacant Land & Commercial Real Estate. We have years of experience and success at finding and selling great Northwoods real estate, and will work with you to make your dreams a reality. Our expertise ranges from residential waterfront to commercial offwater properties, and everything in between. Our office is located in Minocqua, Wisconsin but we also serve surrounding communities such as Eagle River, Land O' Lakes, Manitowish Waters, Boulder Junction and Rhinelander. This includes property in Forest, Iron, Oneida, Price, and Vilas counties. We know why you're here. You're looking for that Northern Wisconsin lifestyle of your dreams. So whether that lifestyle radiates from a vintage Northwoods cottage on a small tranquil lake, a sprawling lakeside estate with a gourmet kitchen every epicurean envies, a cozy country home nestled amongst the beauty and serenity that is the Northwoods, or a Rhinelander city home with easy access to shopping , medical facilities, and commercial airport, our website and "Real Estate Quick Searches" are designed to put you in touch with your real estate dreams. Whether you are buying or selling property, our knowledgeable and helpful REALTORS® are dedicated to your success and will go that extra mile to meet your real estate needs. We service the Greater Tomahawk Area, which includes areas like: Nokomis, Bradley, Skanawan, Somo, Spirit, and King as well as local lakes such as Nokomis, Alice, Clear Lake, Crystal Lake, and the Spirit and Willow Flowages. We can be your link to great residential, commercial, waterfront and recreational properties in Lincoln or Oneida County. Our website also offers access to the Greater Northwoods MLS with 1000's of Northwoods Real Estate Listings just a click away. Welcome to my Real Estate website. 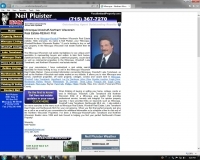 Hello everyone, my name is Neil Pluister. If you're looking to buy or sell your property in the Minocqua Wisconsin real estate market then let me help. 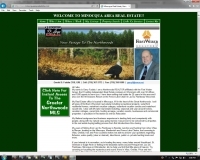 The Minocqua Wisconsin real estate marketplace is very unique and I specialize in representing buyers and sellers in lake front homes, waterfront homes, lake front property, waterfront property, vacant land as well as commercial properties in the Minocqua, Woodruff, Lake Tomahawk, and Northern Wisconsin's real estate market.